1.Choose the desired populated area; select day or night; click “show scenario”. 2. Select one of five explosive weapons systems: 122 mm BM-21 Multi-Barrel Rocket Launcher (MBRL); 155 mm Artillery Gun; 120 mm Mortar; 120 mm Tank Gun; or, Mk 82 Aircraft Bomb. Depending on the weapon system choose precision guidance and munition employment – ie: firing a single munition, salvo or barrage. 3. Choose the direction of the attack, which will determine the impact angle of the munition(s). 4. Click “start selection” and then move onto the scenario. Use the arrow keys to navigate around the scenario and the mouse to zoom in and out; click on the desired point of attack. 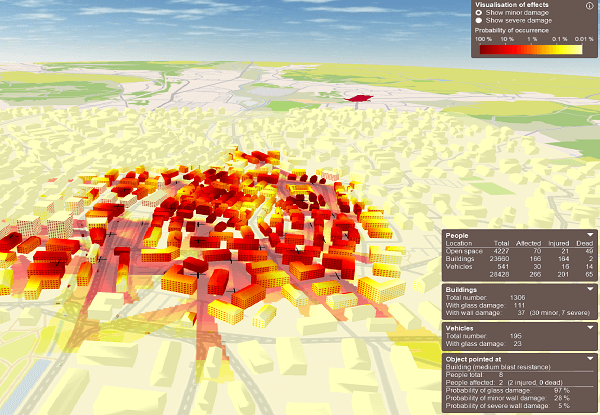 The heat map on the scenario indicates the severity of damage inflicted: from dark red (100% predicted damage/fatalities) to light yellow (1% predicted damage/fatalities). For more detailed information on the algorithmic scale used in the background, click on the “i” (information) box in the corner of the heat scale. Information on the population affected by the attack as well as the damage inflicted on buildings and vehicles is displayed in the boxes on the bottom right. 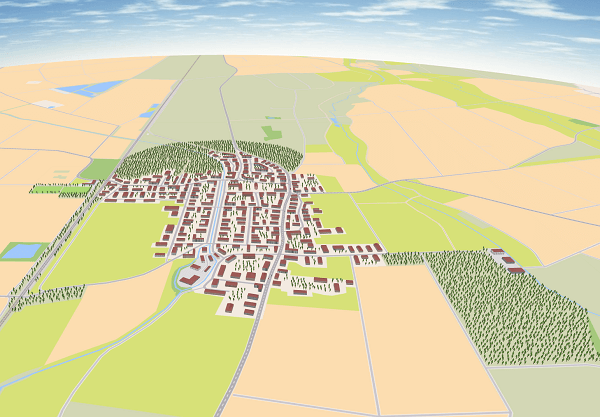 Contextual data, such as the total population and number of buildings in the scenario, are also included. By hovering the cursor over individual buildings, streets and vehicles, the calculated damage specific to that property is displayed in the information boxes. A ruler can be activated to measure the distance between the intended versus actual impact points, as well as distances between furthest impact locations when multiple munitions are fired. This tool therefore allows for a basic analysis of the accuracy achieved when firing a single munition and the degree of precision when multiple munitions are fired (wide area effects).